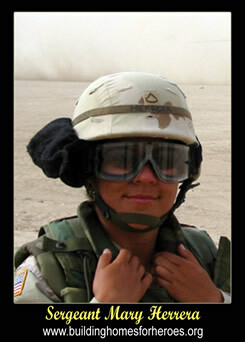 Army Sergeant Mary Herrera of the 855th Military Police Company of the Arizona National Guard, was wounded on November 8, 2003 near Fallujah. Herrera was the M249 Squad Automatic Weapon gunner for the lead Humvee in the platoon when her convoy was ambushed by rifle fire, rocket-propelled grenades and mines. She was struck by two AK-47 bullets in the ambush. Her platoon was on a trainee transportation mission to Abu Ghraib Prison near Ramadi, Iraq. Upon entering a safer area, Herrera started to feel disoriented and noticed a loss of sensation in her right arm. It was later found that Herrera had been hit after firing about 10 rounds of ammunition. Herrera maintained positive control of her weapon to help protect her fellow members during the final moments of the ambush. Herrera was rushed to the nearest emergency medical service facility where doctors discovered she was hit by the two AK-47 rounds that broke two bones in her forearm and pierced her biceps. Once pins and rods were placed in her forearm and she was stabilized, she was flown by helicopter to Fallujah, Iraq, where doctors seemed certain that she was going to lose her arm. After returning to the United States, Mary Herrera was awarded the Purple Heart for wounds received as a result of enemy or hostile action. Herrera did not lose her arm due to extraordinary surgical efforts, and she received numerous surgeries, skin grafts and physical therapy at Brooke Army Medical Center in Fort Sam Houston, Texas. Herrera also received the Army Reserve Component Achievement Medal, the National Defense Service Medal and the Global War on Terrorism Expeditionary Medal, the Armed Forces Service Medal with "M" device, an Army Service Ribbon, an Arizona Service Ribbon and an Overseas Service Bar. The League of United Latin American Citizens awarded Herrera the "Excellence in Military Service Award." She also has obtained a sharpshooter qualification for Badge Rifle M16s and an expert qualification for Badge Pistols. According to Maj. Gen. David Rataczak, of the Arizona National Guard, Herrera is the bravest person he has ever met. He refers to Herrera as a true example of a modern citizen-soldier who, despite being small in stature, is motivated, loyal, physically and mentally capable, disciplined and proficient, courageous and always a professional. Due to her story and her example, the state of Arizona has passed a bill that will authorize tuition waiver scholarships to National Guardsmen and women who received a Purple Heart or were medically discharged due to injuries while serving in the military after Sept. 11, 2001. The bill is affectionately known as the Mary Herrera bill. Sergeant Herrera was the recipient of a home in Arizona.